Tarron and I are old friends. We first met when I was a campus minister serving the University of Nebraska at Omaha and Creighton University out of the Urban Abbey. As a campus ministry, we did lots of outreach to campus and invited college students to participate in worship and events at the Abbey. We were essentially starting from scratch when I started in 2015. And it was hard. Campus ministry is hard, y’all. I’m not sure how many college students you know, but the majority of them are not just hanging around waiting for someone to invite them to a bible study. No really. It’s true. Shocker. So, at the Abbey, we decided to approach connecting with students in a different way – by developing relationships with student groups and finding out how the church could support and serve them, rather than just expect them to participate in the stuff we dreamed up. To start, we connected with the student groups who were sort of natural for us. The Urban Abbey is very progressive and inclusive of lesbian, gay, bisexual, transgender and queer people. And I had been the advisor to Creighton’s Gender and Sexuality Alliance when I worked at Creighton before going to seminary. So it made sense that the first groups we connected with were the LGBTQ student groups at Creighton and UNO. And it was great. The leaders of those groups welcomed our love and support. It was all good. But we didn’t want to limit our mission to just those groups, so we started to connect with other groups and try to find out what they needed. Especially at UNO, the student groups I met with over and over said it was hard to get to know other students. That everybody kind of just kept to themselves and the groups they were already part of, and it was just really difficult to break down those barriers. So we had this idea called The Name Tag Project. (That’s the photo you see here.) For three days, we handed out name tags, and if you were wearing a name tag, it meant that you were open to having a conversation with someone else wearing a name tag. It was pretty great. 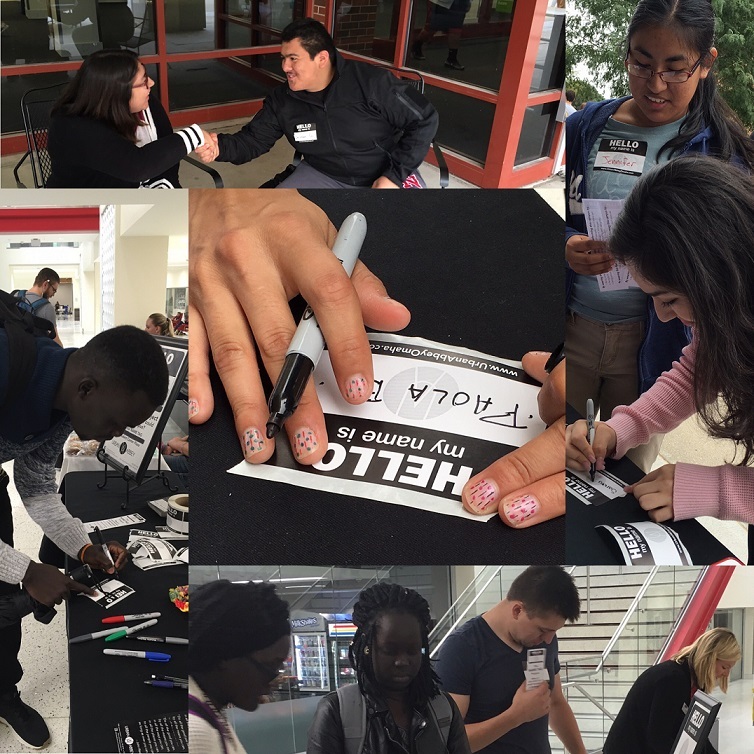 We had all kinds of students from all different groups on campus stopping to get name tags and helping hand out name tags and having conversations. Well, Jonathan told me he was the vice-president of the Student Veterans Organization on campus. And he said that they would love to partner with us. Specifically, he said that the student veterans on campus could use a place to get together and talk about their struggles – and could I maybe lead a group like that? If you were to ask me which group I figured I would be connecting with as a campus minister, I’m pretty sure the student veterans wouldn’t ever have crossed my mind. I mean I had kind of been hoping for a nice sorority or maybe the French club. But I did not know anything about veterans or military life. And if I am being totally honest with you, I was a maybe-more-than-a-little prejudiced. The ethic is this: “Love the stranger.” And for the Israelites, God tells them to love the stranger, just like they love God. The Hebrew word love is the same for both: “ ‘ahab.” The Israelites are to love (‘ahab) the Lord. And because the Lord loves (‘ahab) strangers, the Israelites are supposed to love (‘ahab) the stranger as well. Now, the book of Deuteronomy makes clear that the Israelites are God’s very special chosen people. And because they are special and chosen, they are not only supposed to love God, but they are supposed to love LIKE God. Just like God loves the stranger, so they are supposed to as well. This is part of the Jewish tradition that Jesus believed and taught. The way Jesus articulated this was to say, “Love your enemies.” In other words, whenever you encounter someone you think is a stranger or an enemy, your job is pretty clear: love them. Love them like you love God. Love them like God loves them. Well, crap. That sure puts a lot of pressure on us, doesn’t it? We can’t just hide out in our own little groups anymore and care about ourselves. We have to love the stranger, our enemies, those people who frighten us, those people we don’t understand or agree with. So, given that, I got about the work of loving these strange student veterans. First, I admitted my prejudice, and I admitted my lack of knowledge. One of the reasons I was afraid of, intimidated by these student vets is that I didn’t know anything about them. So I called up a colleague who was a military chaplain. She and I met for coffee; we talked; she gave me some book recommendations. I read a book called Tribe by Sebastian Junger. I read a book called Soul Repair which is filled with stories of veterans’ experience in war. From those books, I learned some important things. First the Tribe book taught me that veterans sometimes struggle when re-entering civilian life because the military gives them some really positive things: a group of people who care for and support one another, and it gives them a greater purpose for their lives. And in modern civilian life, we often lack both of those. And the Soul Repair book, more than anything else, taught me that veterans need to be seen as fully complex human beings with strengths and weaknesses just like the rest of us. It taught me that the most important thing we can do is neither demonize nor put veterans on a pedestal – because both of those things prevent us from seeing them as fully human. Before we can love someone, we have to be able to see them as who they really are. So, having done my work and my reading, I started a program called “Coffee Talks” with student veterans at UNO. (It is still going on and being led by my friend Joel Walker who preached here this summer.) And there, I learned to see veterans as fully human. I learned that veterans are very diverse. The students in my group were of many ages and races. I learned that veterans are not all of one mind politically and spiritually. One of our meetings was the day after the 2016 presidential election, y’all. And we had people in that room who voted for every candidate (including the libertarian), and we still managed to love and listen to one another. And it turned out that student veterans have all the same struggles as any old college student: school and finances and relationships. And as a bonus: the student veterans supported me as I was waiting to see where I would be appointed in ministry next. They understood the reality of committing yourself to something so much that you would actually go wherever the powers-that-be sent you. Most civilians can’t imagine what that’s like. My veteran friends understood it better than even my family did. For us Christians, like the Israelites in Deuteronomy, we are meant to understand that part of being chosen by God, part of being in this band called “Christian and Methodist” is that we are called to love like God. And God loves even those people you would call strangers…even those people you would call enemies. What I learned about that from my time with the student veterans is that, as open-minded as I thought myself to be, I still had people in my life who I thought of as strangers – and it was my job to learn and to be in relationship with them, so I could learn to love them like God loves them. And the other thing I learned is that God gives us the rule about loving the stranger not as a burden – but as a blessing. When I went to my last “Coffee Talk,” Jonathan and the Student Veteran Organization gave me a card of thanks, and a t-shirt that says “UNO Office of Military and Veteran Services.” And I can wear it with pride. Thanks be to God – who turns strangers into friends, for our good and the good of all creation. 1) Have you ever had the experience of someone assuming something about you that wasn’t true? How did that make you feel? 2) Have you ever had an experience where you got to know someone and you found out that you had been making some incorrect assumptions about them? Tell us about it. 3) Is there a group of people you still see as “strangers”? What could you do to learn more about them and their life experiences?